The essence of a pillow is to provide support for the neck as the rest of the body is held in place. Pillows can also be used for decorative purposes. They can be used on beds, chairs or couches. It is highly probable for people to wake up with sore necks. This sore neck is more often than not, as a result of sleeping on a pillow that is not suitable for your particular way of sleeping. A good mattress one buys should go with a better pillow. This amazing product by Coop Home Goods is one of the reasons you might wake up feeling psyched for the day after having a good night sleep. This USA made pillow comes in either king or queen size depending on your preference. The cover is a combination of polyester and bamboo obtained from viscose rayon. This pillow does not have any ozone-depleting compounds such as heavy metals, flame retardants among other compounds. This pillow is amazing even for allergy sufferers as it does not cause any allergic reactions. Therefore there is no need to compromise on comfort. 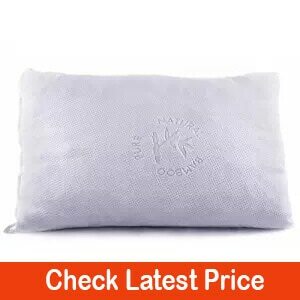 The inner fill material of the pillow is easily adjustable. 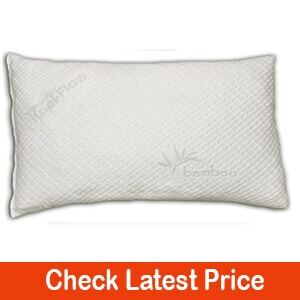 This pillow is made such that the foam inside your pillow can be added or removed. As a result, it is comfortable for the user. Provides firm support for your neck and keeps it in line. You will get comfort from this this pillow, thanks to the use of a combination of bamboo, polyester, and lycra. It has proven to be the best kind of pillow for whichever position you sleep in. It is particularly best for side sleepers. It has a comfortable cover which is made of a material that allows proper circulation of air. The inner fill material is of shredded type combined with memory foam which is known not to deform easily. It is hypoallergenic which makes it convenient for people with allergic reactions! The material used for making this pillow is environmentally friendly from Ecofriendly Biogreen and Centipur-us. This US made pillow is made from buckwheat hulls which are tiny husks covering the buckwheat kernel. The pillow cover is purely made of cotton. 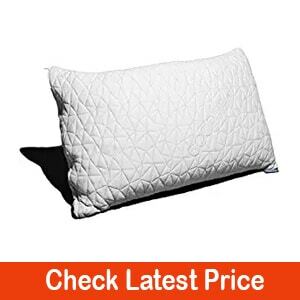 The pillow is suitable as it will not collapse which might affect your neck when your head sinks too low. The presence of the buckwheat ensures there is adequate air circulation which allows for cooling of the pillow. 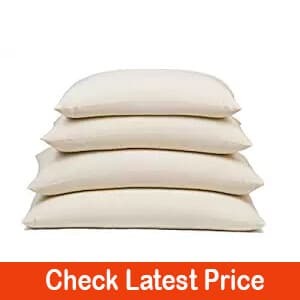 This pillow can be adjusted to remove or add some husks if the pillow has not reached the required height you desire or if it is too firm for your liking. This pillow is originally made in the US. 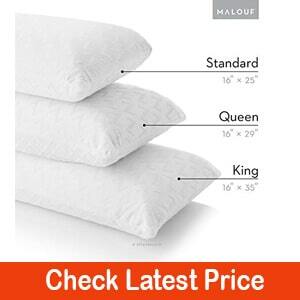 It comes either as a queen, standard or king size pillow. It is the best bed pillow for almost all sleep positions as it provides the ultimate comfort. The pillow covers are made from bamboo which allows for air circulation which means the pillow will stay cool. In the end, you will have a deep and uninterrupted sleep. The pillow is convenient for people with allergies for being hypoallergenic. The memory foam provides you with the perfect cradling for your head. Unlike most other pillows, this one can be washed in a machine. This important feature may be ignored or overlooked. The fabric covering the pillow is 50% polyester and 50% bamboo with high heat resistance. This sleeping surface lasts longer. Using the wrong pillow means you will find yourself nursing a sore neck in the morning. 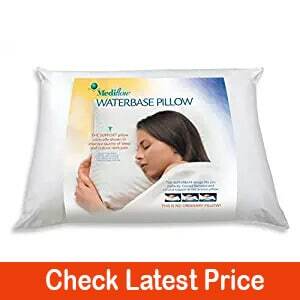 To avoid this, buy this Waterbase Pillow. This pillow provides maximum support to your neck while the rest of the body is held perfectly in place. The pillow is designed such that you can adjust it to the firmness you find fit. Made from the US, it has a cover made purely of cotton. The pillow has even been tested for giving the superior quality of sleep. The aeration of the pillow is really good hence less heat retention. The inner fill material is also hypoallergenic. It’s easy to clean the pillow in a washing machine. It’s relatively large thus providing total support for your neck. A lot of pillows have been made to provide support, but this one is made perfectly to provide support while catering to the other parts of the body. Water in the water chamber can be adjusted to the firmness you desire. Provides perfect support for your neck while the spine is held in the right position. Polyester covering for the water chamber and cotton case which allows for easy aeration hence cool throughout the night. 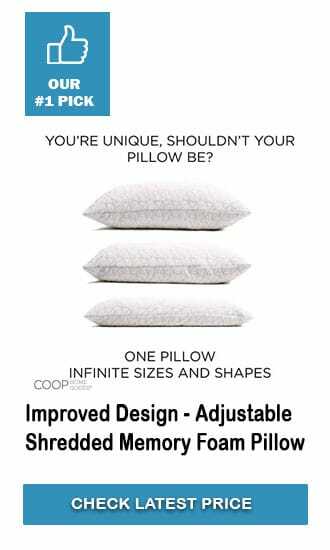 This bed pillow from the US is purely made of Talalay latex without any synthesized additives. The pillow comes in king, standard or queen size and you can decide whether to take one that is a plush or high loft. This pillow is good for providing support to your neck while the back is held in a suitably upright position. Using this pillow will help relieve your back pains. The cover is removable and made of rayon. The pillow does not immediately re-plump after it has been squeezed which makes it suitable for those who love a squishy pillow. The pillow is dust mite resistant and does not allow accumulation of moisture which might encourage the growth of mildew. 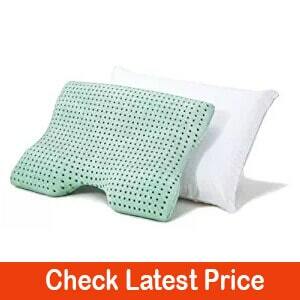 The pillow is made with tiny air holes that allow circulation of air and enhances breathability. The preference on a pillow greatly affects your sleep which in turn affects your day. This US-made pillow has a cover purely made from cotton. It provides support for your back, stomach, and neck. The inner material is memory foam that is plush and maximizes comfort for the user. The pillow is made of microscopic beads embedded in the pillow that allows for air circulation providing a cool effect, or it releases the heat, and it provides warmth. We recommend this type of pillow because it offers excellent spinal support, particularly to those accustomed to side sleeping. This pillow provides the best support due to its protective cushioning design which makes it suitable for the neck and spine. 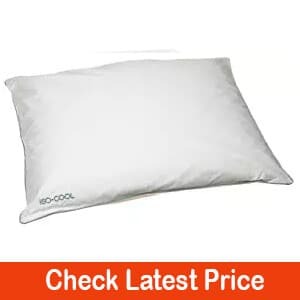 A great visco foam memory pillow made by Sleep Joy, it is best for back sleepers. It uses green tea and other plant-based ingredients to eliminate any odor that may arise from chemicals. The green tea also helps by enhancing better circulation of air in the pillow.The pillow is of very good quality and very durable. It is soft and hypoallergenic. Polyester and polyurethane are used as the fabric which is good as no moisture will be absorbed. This pillow is a blend of polyurethane and various other chemicals. The pillow takes the shape of your neck when your head applies pressure, or you generate heat. This is one that is filled with water but not entirely. It has a layer of polyester on top. This pillow has micro beads inside used as filling. The beads are made of polystyrene. From our selection of some of the best pillows on the market, you should now have the confidence to choose one that suits your sleeping needs. Our recommendation is that you should always be very picky when choosing a pillow. You will be spending a good portion of your 24 hours on it! Make sure you sleep for a total of at least 6 hours daily for your body recovery and repair. A good pillow a day will surely keep the muscle pains away!